A quick and easy one layer card today by way of contrast with the steampunky stuff in the last couple of posts! The boy with the book was stamped and masked then the central square masked off with Post-It notes and sponged with ink. I inked the background stamp randomly and didn't press hard so there's a "hit and miss" kind of randomness to contrast with the very straight lines of the inked square. I added a tiny bit of shading to the boy's skin and clothing with Copics, stamped a sentiment and called it done. The stamp is from the Relish Reading set that I picked out as a prize when I won a Gingersnap challenge some time ago - thanks Rogue Redhead! I've seen quite a few cards made with the girl reading in a chair that's in the same set but this chap doesn't seem to get much of a look-in - a shame I think as he's good for more masculine projects! what a great card - very striking for being one layer! lovely card, great for a male but also for a teacher or retired teacher. Fabulous card, Joanne. Love the stamp too - a bit Just William (although he'd never be caught dead reading a book lol). Love the card Joanne, your techniques are so effective and look so effortless too. Really good to see some masculine stuff, he looks every so cheeky and as if he is about to get up to lots of mischief lol. 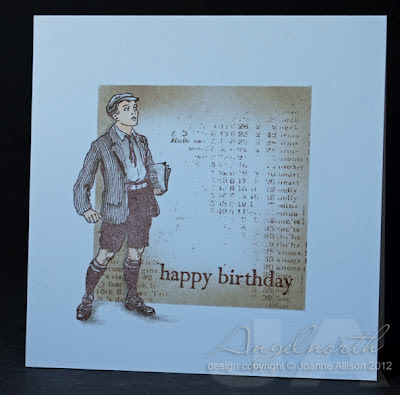 Fab OLC Joanne and that stamp is great, just perfect for a male card. Like the way you have created the background too. Great card! Love how you used your Relish Reading set!